HomeBasketballWhat will it take for Syracuse to get in the tournament? 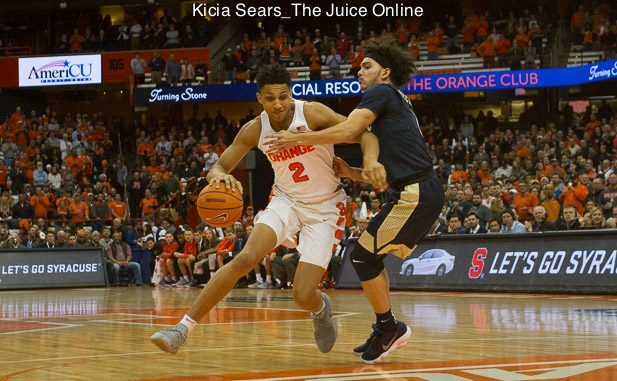 Syracuse forward Matt Moyer drives during the first half of the Orange's game against Pitt. Mandatory Photo Credit: Kicia Sears, The Juice Online. If the season ended today, the Orange would likely be an NIT team. With five games left in the regular season, there’s still time to change that, but looking at the schedule that lies ahead, it’s going to be monumentally difficult. The latest ESPN bracket has Syracuse as one of the first four out. Their bracket has nine ACC teams in the field and the Orange are tenth in the conference. We asked Geoff Johnson, owner of Mytopsportsbooks.com, if he has any input on Syracuse’s fate for March Madness. He replied, “the road win over Louisville was crucial, but the home loss to NC State basically undid all of that. They’re going to be on the outside looking in barring a miraculous stretch run. The final five games for Jim Boeheim and crew include potential resume-builders against Miami (road), UNC (home), Duke (road), and Clemson (home), along with a must-win against Boston College (road). Unfortunately, “resume-builder” is just a euphemism for really hard game. Miami, UNC, Duke, and Clemson are all over .500 in ACC play, and all but Miami are ranked in the top 15 nationally. If Syracuse goes 1-4 in its final five games, they will need to win the conference tournament to get into March Madness. If they go 2-3 in that stretch, they will have to string together at least a few wins in the ACC tourney. If they can somehow find a way to go 3-2, they just might be on the right side of the bubble heading to New York. A 3-2 finish would leave the Orange with a 9-9 ACC record and 20-11 overall record, and it would also mean at least two more top-50 RPI wins. But temper your expectations. Syracuse is just 2-5 vs RPI top 50 teams so far, and one of those wins was against Buffalo. Coach Boeheim is basically playing a six-man rotation and that’s liable to become more of an issue late in the season as fatigue becomes a bigger factor. In reality, everyone in Orange nation should start bracing for two trips to New York, one for the ACC tournament, and one for the NIT.